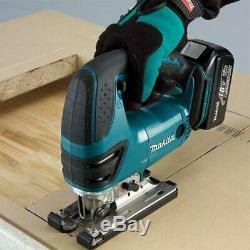 Makita XVJ03Z 18-Volt LXT Lithium-Ion Jig Saw (Tool Only, No Battery). Brand New in Original Packaging. Makita-built variable speed motor delivers 0-2,600 strokes per minute. 3 orbital settings plus straight cutting. 2-finger variable speed trigger for added convenience. Heavy gauge, precision machined base for smooth, accurate cutting. The Makita XVJ03Z 18-Volt LXT Lithium-Ion Jig Saw is a powerful portable saw with a variable speed motor that can deliver 0-2,600 strokes per minute for fast and efficient cutting. It has 3 orbital settings plus straight cutting so it can be used for a wide range a materials for a wide range of applications. The large 2-finger variable speed trigger and rubberized handle make this tool comfortable to use for a long period of time. It has Star Protection Computer Controls that protect against over-loading, over-discharging, and over-heating. A heavy gauge, precision machined base adds a second layer of durability. The Makita 18V Jig Saw is a lightweigh and versatile saw, great for any project, especially when there isn't a reliable power source. Makita-built variable speed motor delivers 0-2,600 strokes per minute for fast and efficient cutting. 3 orbital settings plus straight cutting for use in a wide range of materials. "Tool-less" blade change system allows for faster blade installation and removal for increased productivity. Large 2-finger variable speed trigger for added convenience. Heavy gauge, precision machined base for smooth, accurate cutting and added durability. Light illuminates the work area. Weighs only 6.1 lbs. With battery (battery not included) for reduced operator fatigue. Rubberized soft grip handle provides increased comfort on the job. Equipped with Star Protection Computer Controls to protect against overloading, over-discharging and over-heating. Only use genuine Makita batteries and chargers. What's in the Box. (1) Jig Saw Blade, T Shank, HCS, 4-1/8 x 9TPI (792529-7-1). Length of Stroke - 1. Cutting Capacity (wood at 90°) - 5-5/16. Cutting Capacity at 90° (steel) - 3/8. Strokes Per Minute (variable speed) - 0 - 2,600 SPM. Blade Shank - "T" Tang. Battery Charge Time (minutes) - 30. Net Weight - 6.1 lbs. F There are product categories which are not returnable due to hygienic or sanitary as required by manufacturers. In an event where there is an error regarding a price error or description, we will notify you ASAP. Items removed from their'blister-pack' display packaging are non-refundable. 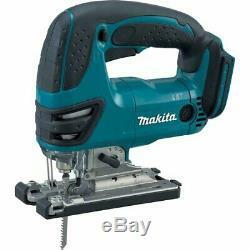 The item "Makita XVJ03Z 18-Volt LXT Lithium-Ion Jig Saw (Tool Only, No Battery)" is in sale since Wednesday, March 6, 2019. 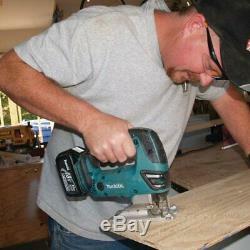 This item is in the category "Home & Garden\Tools & Workshop Equipment\Power Tools\Saws & Accessories\Jig & Scroll Saws". The seller is "asavings" and is located in Brooklyn, New York. This item can be shipped to United States, Canada, United Kingdom, Denmark, Romania, Slovakia, Bulgaria, Czech republic, Finland, Hungary, Latvia, Lithuania, Malta, Estonia, Australia, Greece, Portugal, Cyprus, Slovenia, Japan, China, Sweden, South Korea, Indonesia, Taiwan, South africa, Thailand, Belgium, France, Hong Kong, Ireland, Netherlands, Poland, Spain, Italy, Germany, Austria, Bahamas, Israel, Mexico, New Zealand, Philippines, Singapore, Switzerland, Norway, Saudi arabia, Ukraine, United arab emirates, Qatar, Kuwait, Bahrain, Croatia, Malaysia, Brazil, Chile, Colombia, Costa rica, Panama, Trinidad and tobago, Guatemala, Honduras, Jamaica, Antigua and barbuda, Aruba, Belize, Dominica, Grenada, Saint kitts and nevis, Saint lucia, Turks and caicos islands, Barbados, Bolivia, Ecuador, Egypt, Gibraltar, Guadeloupe, Iceland, Jordan, Cayman islands, Sri lanka, Luxembourg, Martinique, Maldives, Nicaragua, Oman, Pakistan, Reunion, Viet nam, Uruguay.